I finished up January's Lucky Star block and boy does it keep your eyes moving. I am totally loving these blocks. They are super fun to make, come together great, and are pretty quick, now that I have my mind wrapped around paper piecing again. One of my wonderful nieces has now claimed this quilt for her bed when it is finished. Maybe I can even get the last block done early Dec and get it all quilted up by Christmas. I just love quilting for someone, it makes the process that much more fun!! And in other news . . . 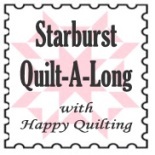 If you have been waiting for the Starburst Quilt-A-Long you need not wait much longer!!! It all comes out on Monday!! I am so excited :) I just can't wait to quilt-a-long with all of ya!! So grab your button and get ready to go. It's going to be so much fun!!! Looking great, it's going to be interesting to see them in all the different fabrics people have chosen! waaa!!! i was soo ready for this and then the plumber had to cut a panel in my sewing room to get to a pipe. sewing room out of commission still! i'll have to catch up... or figure something out. Wow, your block looks so much different than mine! It must be the colors you chose, they look great! And the fact that the center fabric is not consistent I find a great idea! Is the starburst Qal the swoon quilt with 4 blocks? Do you have any descriptions written up I could read? The Lucky Star is so pretty as is the Starburst. Whoo Hoo! I can't wait for the quilt-a-long! YAY! I agree it's a lovely block. Ok...Starburst starts tomorrow, but that means you will be giving material discounts and size information or I was supposed to follow the link and already have my fabric purchased? If the latter, I'm behind. Darn! But I still want to join! Your paper piecing stars are so pretty!